ELF adds the San Francisco Public Library to its system. A photo, a burger, and a short story about patronizing the neighborhood. 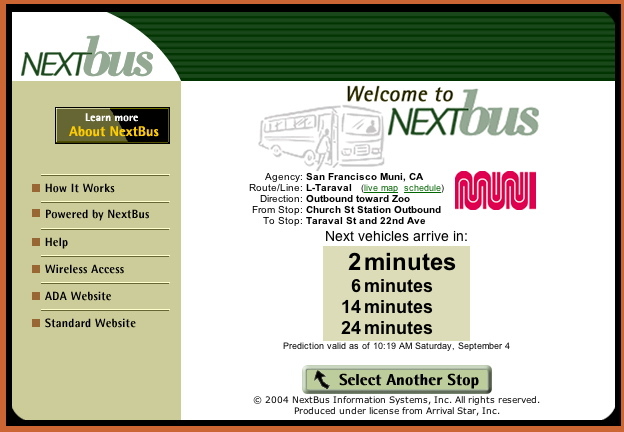 NextBus provides real-time, per-stop predictions for several public transit systems across the U.S. (view all); we San Franciscans who rely on MUNI are fortunate enough to get accurate arrival times for any stop on the light rail line (F, J, K, L, M, N or S) as well as all stops along the mighty, ambling, urine-soaked 22-Fillmore line (don’t laugh: it stops a couple of blocks from Bottom of the Hill). Unlike the speculative “schedules” that MUNI publishes, NextBus “uses satellite technology and advanced computer modeling to track vehicles on their routes.” So no guessing, standing in the rain, or watching as the last streetcar of the night pulls out of the station without you in it. As someone who lives 1/2 a block from a stop, I can tell you this actually, really works. And, inexplicably, hardly anyone I know seems to know about and use it.